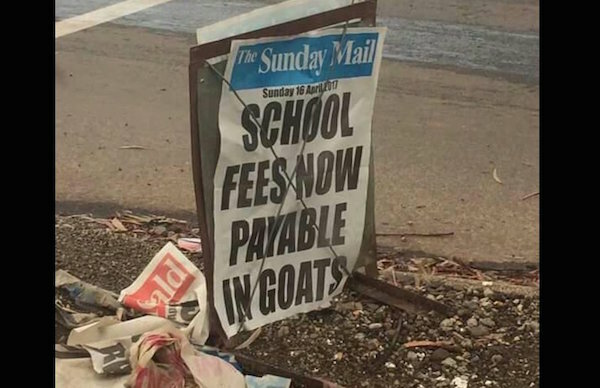 Zimbabwean state authorities say local people can now offer livestock like goats or perform some work at schools as a way of paying school fees for children. Primary Education Minister Lazarus Dokora and the ministry’s permanent secretary Sylvia Utete Masango told the state-controlled Sunday News newspaper that this can be done by parents failing to raise cash in an economy hard-hit by crippling money shortages. Dokora is quoted by the newspaper as saying schools should be flexible and ensure that people without cash can either pay fees in the form of livestock or offer their services to school authorities. This move has set the social media sphere on fire with some people claiming that the government has crippled all operations in the country, forcing it to come up with an idea of batter trade in schools. Goats eat yam abi? Ehen, perhaps school fees can be paid in yam as well. No! The goat will eat the yam. They should use Isi ewu (goat head) pepper soup. Pepper soup with goat head should be used for school fees. Moi moi and amala will be okay too.